F-16.net • F-35 with damaged coating? Does any one know what happened to this F-35 and why its coating is like that? Re: F-35 with damaged coating? Same problem plagues the Viper: RAM in certain areas cracks after years of application. Normally the splitter above the intake, intake lip, intake leading up to engine (ripples), and the vertical surface between the flaperons and horizontal stabilizers. Send the aircraft to corrosion control for some TLC. If you do a Google Images search on this image you find out that it shows Lt Cdr Ian Tidball RN taxing out at Edwards Air Force Base. 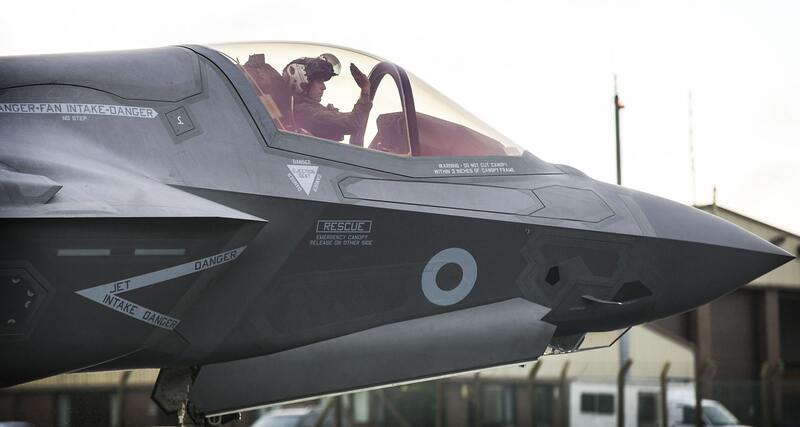 This is therefore likely to be one of the three F-35Bs used by the British RAF and RN personnel for operational testing and evaluation at Edwards AFB. My guess is that, in this role, maintaining the LO coating is not a high priority. That's a start on provenance. Thanks aussiebloke. My search on that info brings up just a Pinterest pic that is only 236 × 157. A blow up of a shrunk down pic raises more questions about what we're seeing than answered ones. The word 'artifacts' comes to mind. If anyone is really interested in what they're seeing, I guess they could dredge the Royal Navy photo archives for the original. Six page PDF of 'BLACK KNIGHTS at Edwards AFB' story from AirForces Monthly Jan 2018 magazine with TIDBALL attached. Jamie Hunter probably took the photo under question whilst searching 'pinterist' is an exercise in futility I reckon YMMV. JUST A THOT: Wouldn't it be NICE if the OP gave us the source of the photo? Instead we go down pintwist RABBIT HOLES. spazsinbad wrote: JUST A THOT: Wouldn't it be NICE if the OP gave us the source of the photo? Instead we go down pintwist RABBIT HOLES. Is it beneath you to give a link/url to this picture/site? Basically that article says it discovered the blistering coating around the edge of canopy showing F-35 has fatal defects. US has deployed so many F-35s, they cannot keep up with the maintenance. US spent huge amount of money on the 3rd generation stealth coating, but it turns out to be not enough. Russia has the same problem. China has better materal, J-20 never has such problem. Finally it lamented J-20's engine is not good enough, and the evil Lockheed Martin makes too much money. Usual material from Chinese internet, only good for entertainment. Anyway, the jet pictured likely is one of the first F-35s of UK, BK-2? https://ukdj.imgix.net/2017/12/38GpPO-O ... 86-319.jpg ZOOMED to bubbles around canopy external seal. OK, I'll say it. garrya's first image looks so typical of a coating applied to a poorly cleaned surface where the cured coating did not come into contact with the surface to be covered at any point due to intervening grunge. No, let me say it. Given the only place anyone has seen what looks like what is in this photo at a Chinese media site...is at that media site, and with no other evidence to the contrary, I see this as a photoshopped propaganda designed for internal consumption to keep the local yokels alert against the imperialist Yankee dogs. But that's just me. And then I'll say, does it matter? When they did the RCS testing they met the RCS spec after using a knife to gouge 8 inch long cuts in the skin. IF, and I do mean IF, an F-35 has blistering about the cockpit then e1loops explanation is reasonable and that still doesn't mean an F-35 becomes a B-52 on radar. It might degrade it to an F-117, maybe. Non-story. Jets (all...ALL) get minor dings and are repaired all the time — as in routinely. Not all dings require immediate resolution, and once resolved are not always perfect nor permanent. Thus they may require another round of repair(s). I saw this on a display bird at Ellington Field in fall of 2017 and asked the attending tech sergeant about it. He said it was a common result of the hot sun baking the aircraft while sitting on the ground in hot places like Arizona. As it seems to only affect the canopy frame, the fix seems obvious fix: What about making a outer cover of silver-backed bubble-wrap like I use in my car? It can fit on the outside and clip on the canopy lip. It will also keep the cockpit cooler. Heheh 'SWP' you have reminded me of that 'famous' F-35 pilot quote that he could fly it with a BAG OVER HIS HEAD! Also that TINFOIL could be a great poorman RADIATION SHIELD for B61 when not practice bombing? This photo was taken at Edwards AFB on May 19, 2015, according to the EXIF. Here is a picture I took of the blistering cockpit. It seems to me that a "whole canopy" solution would address the obvious heat issue inside the cockpit (evidenced by the existing shield) and any external frame issues. It also has the added benefit of keeping the cockpit cooler than the existing inside shield could do. If you look closely at some of the posted images L-M has on the Flickr site, it looks like the coating is actually a tape like material. lamoey wrote: Here is a picture I took of the blistering cockpit. sprstdlyscottsmn wrote: And then I'll say, does it matter? ... It might degrade it to an F-117, maybe. If the RCS material molecules have not chemically altered into something else, they should keep absorbing radar wavelengths to spec regardless.